Spectacular events determined the highest and lowest elevation points on Mars. The lowest point was blasted by an enormous asteroid impact which formed the Hellas Impact Crater. The highest point was built by repeated eruptions of Olympus Mons, the largest volcano in our solar system. Although Mars is a smaller planet than Earth, the heights and depths of these features are enormous in comparison. 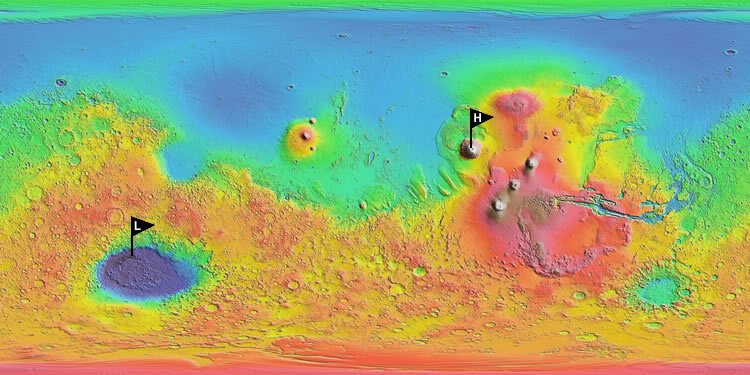 Topographic Map of Mars: The image above is a colorized topographic map of Mars. This Mercator projection map	shows low elevations as a deep blue color and high elevations as a white color (see elevation scale below). The map was prepared by NASA and is based on data from the Mars Orbiter Laser Altimeter, an instrument on the Mars Global Surveyor spacecraft. The highest point on Mars is the Olympus Mons Volcano (marked by a flag with the letter "H"). The peak of Olympus Mons is 21,229 meters (69,649 feet) above the Mars areoid (a reference datum similar to Earth's sea level). The lowest point is within the Hellas Impact Crater (marked by a flag with the letter "L"). 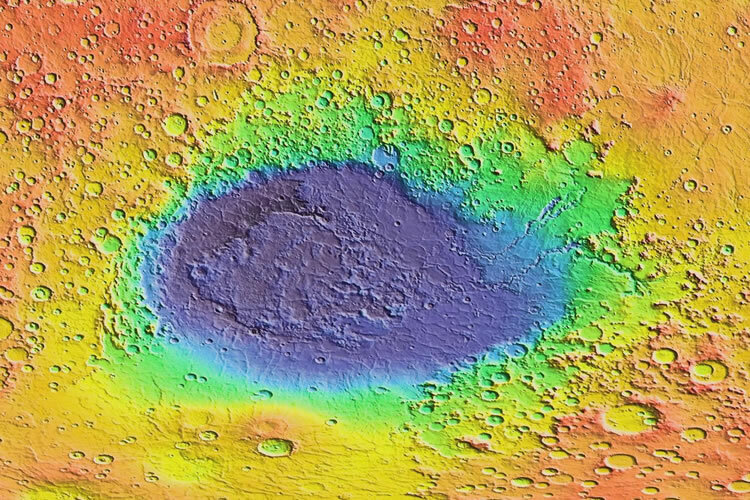 The lowest point in the Hellas Impact Crater is 8,200 meters (26,902 feet) below the Mars areoid. 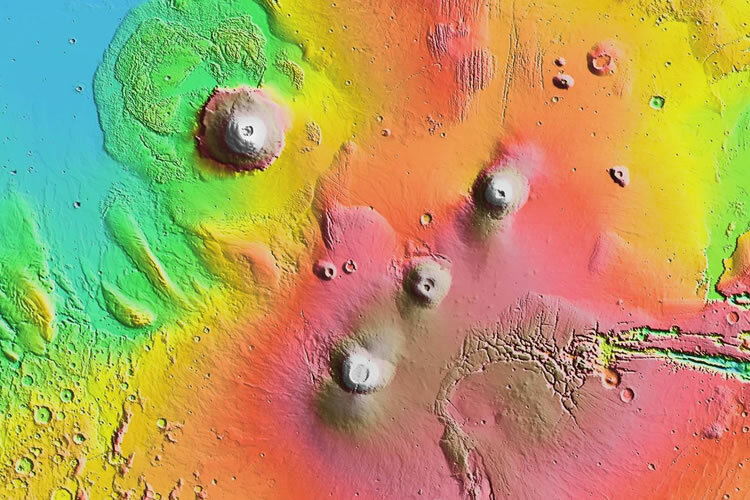 Detail maps of Olympus Mons Volcano and the Hellas Impact Crater are shown below. On Earth we use "sea level" as a reference datum. The elevation of mountains are given in feet above sea level and the depths of the ocean are expressed in feet below sea level. On Mars there is no sea level to serve as a reference. Instead a substitute datum is used. This datum is known as the Mars areoid. To create the Mars topographic map, data from the Mars Orbiter Laser Altimeter was used to calculate the radius of Mars at millions of observation points across surface of the planet. Martian elevation values were obtained by subtracting the radius of the Mars areoid from the radius of Mars at each observation point. The resulting elevations were used to produce the topographic map. Olympus Mons Volcano - Highest Point on Mars: Olympus Mons volcano is the highest point on Mars at an elevation of 21,229 meters (69,649 feet) above the Mars areoid (a reference datum similar to Earth's sea level). It is also the highest mountain in the solar system and the solar system's largest volcano. In this image, Olympus Mons is the largest volcano. Lava flows from Olympus Mons and its neighboring volcanoes have resurfaced the planet in this area. These lava flows are not heavily cratered, revealing that the eruptions which formed them occurred at a point in the planet's history that was after the heavy asteroid bombardment. NASA Image. Oblique view of Olympus Mons from the Mars Global Surveyor Mission. Olympus Mons is an enormous volcano. It stands about 25 kilometers (15.5 miles) higher than its surrounding landscape and it is over 500 kilometers (310 miles) in width. The map above has been enhanced to make topographic features more obvious. On that map, Olympus Mons looks steeper than it actually is. Olympus Mons is a gently sloping shield volcano, much like the volcanoes that make up the Hawaiian Islands. If you were placed on the flank of Olympus Mons and not told that you were standing on the slope of the volcano, you could probably look around and think that you were standing on a gently sloping plain. You would see a gentle slope upwards in one direction and a gentle slope down in the opposite direction. If you were placed on the rim of the summit crater and looked down the slope of the volcano, your horizon would be located on the volcano's flank. The volcano is that gently sloping and that immense. Astrogeologists believe that plate tectonics processes on Mars are no longer active. Olympus Mons is thought to be located on a stationary "plate" over a deep hotspot. The stationary nature of the plate has kept the Olympus Mons fixed above the hotspot, allowing repeated eruptions to build it to a very great height. Vertical image of Olympus Mons from the Viking Orbiter Mission. In the vertical image from the Viking Orbiter Mission, a sharp change in slope can be seen as a light area that almost completely surrounds the volcano. This light area marks a steep cliff or escarpment about one to four kilometers in height. The origin of this escarpment is debated but remains unknown. Ideas of it being a product of faulting, erosion, landsliding and uplift have all been proposed. Hellas Impact Crater (also known as Hellas Planitia) is an enormous impact crater in the southern hemisphere of Mars. It is about 2,300 kilometers (1,400 miles) in diameter and about 9 kilometers (5 miles) deep. It is the largest impact crater on the planet. NASA Image. Lowest point on Mars: Although the Hellas Impact Crater usually receives all of the credit for being the lowest point on Mars, the honor actually should go to a younger and much smaller impact crater located deep within the Hellas Impact Crater. It is marked in the image above by a red flag. The asteroid that produced this crater blasted through the floor of the Hellas Crater to produce the lowest elevation on Mars. NASA Image.